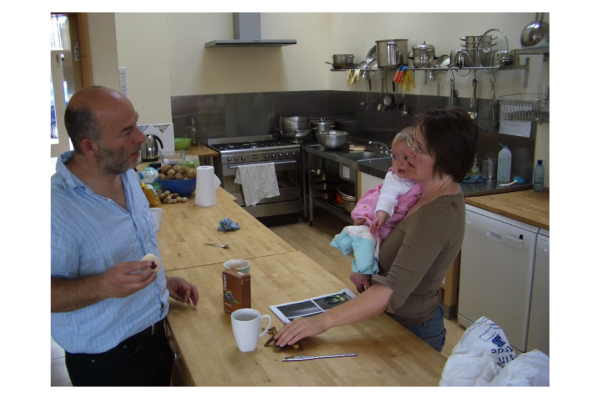 Helen and David left London in 1995 to start a mostly home-schooling community in Bradford on Avon. By chance, David saw a rambling Victorian Mansion in a property auction magazine. Three weeks later with a £28,500 deposit and 3 other families agreeing to live there, they had bought the mansion at auction without having the 90% balance due in 28 days. David received a mortgage offer in 2 weeks from Triodos bank. This was secured against their house in London. 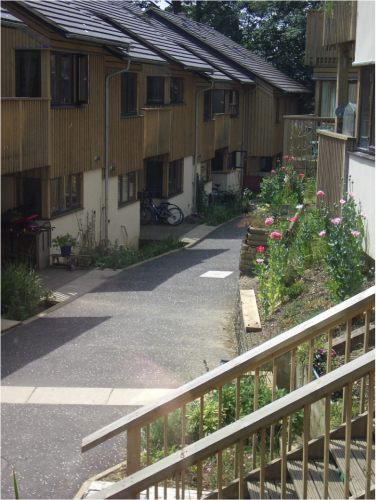 A wonderful Cohousing Community was created, the first to use that term in the UK. There are now two communities in Frankleigh House. David and Helen wanted to set up a new build cohousing community, closer to the Cohousing model. They wanted to create a kibbutz like experience but with more personal independence and to be urban. They were motivated by the success of Frankleigh House. At first it was to be in Bradford on Avon near Frankleigh House but after their move to Stroud, because of their children, that become the new location. Subscribing to Estates Gazette and land agents, David found 2 possible sites in Stroud. One was more town centre. Helen stood in the preferred site, a derelict 2 acre urban site surrounded by trees. She said, “yes, this will work”. David had negotiated a flexible deal with the land owner. It meant that payments would only be made when each plot was sold plus a small initial deposit of £50,000. After many meetings in Rugby and 5 months later, communication went dead. A land registry search showed the land had been re-possessed by the HSBC bank, the owner had gone bankrupt. Negotiations began afresh with GVA Grimley, the bank’s surveyors. They wanted their money asap and did not want to negotiate. The deal was, best offers by the next Friday with a binding 10% deposit lodged with solicitors. They were competing with 4 large house builders. David asked if the bank would consider a delayed completion of 12 months with interest. The answer was that if our offer was significantly higher then they might accept that arrangement. On Monday 5th September 2000 their solicitor phoned to say they had exchanged contracts. Their initial deposit was £50,000 , increasing to £150,000 in 4 weeks. David and Helen had 12 months to pay the balance of £400,000 plus rolling interest at 8% p.a. David and Helen now wanted to recruit residents. The reasons for wanting to get residents on board early were to demonstrate to Helen and David that the project would be popular and viable. A few days after purchase they were in a panic and wanted to pull out as they didn’t believe anyone would be interested in committing to cohousing with actual money.GVA Grimley, acting for the bank, resolutely refused to cancel the contract, even if we forfeited our deposit of £150,000. The American architects, who coined the term Cohousing, thought that resident involvement in the design, was an inherent part of Cohousing. David had secured 80% funding in principle from Triodos bank so did not need early investors for financial reasons. David and Helen naively believed in those cohousing principles and invited future residents to become directors of the development company. Ironically the group process turned out to be the biggest risk factor, both emotionally and as a management structure for a development company. Residents, in turn, wanted cost certainty and most did not want to be part of the daily crises and dramas that are common in property development. The residents wanted significant input into the overall design and that of their individual houses and flats. That was achieved and worked well, given the difficulties for an architect working with a 60 member client group. The planning risk was present but it was considered to be minimal. David was the managing director and paid a fee of £30,000 (later another £30,000 was agreed). This was described in the shareholders agreement to which all new members agreed. His job was to buy the land; engage architects, engineers and consultants and liaise with them; recruit members; get bank funding, collect funds from members, do the company accounts and VAT, setting up 2 companies and managing them; keep members records, manage the bank account, make payments; design and manage the web site; instruct solicitors on the Lease etc and draft the mem and arts, manage all aspects of the project; report back and liaise with members via email and monthly meetings. The meetings ratified decisions made by David during the month and the meetings made new decisions when needed. David was supported in his role throughout this 5 year project by Helen and a small group of members who offered advise on the many inter-personal and other issues and were generally a great comfort. The original plan was for each resident to secure a self build mortgage and to finance their own build using a single contractor for the whole site. Self build mortgages for every house became difficult, the lenders wanted a more mainstream scheme, where a builder builds one house for the borrower. David looked for a single lender for the whole scheme. Triodos Bank was the obvious place. They had lent David and Helen money for Frankleigh House Community in 1995 in under 2 weeks and had offered on the land at Springhill. What followed was a protracted nightmare and a complete waste of time for over 8 months, during which time Triodos kept moving the goal posts. Triodos never said no, just kept asking for more information, the group spent over £10,000 on Triodos’ solicitor’s fees and their accountant’s fees. David approached the Coop bank after a recommendation from Hockerton project. The Coop were amazing, very fast and efficient. Less paper work and no upfront fees. They offered us a credit line of £4M, which in addition to loans from residents was sufficient to build the project. The Triodos loan offer on the land was not needed. The land purchase was completed after 8 months, 4 months early. The purchase was completed in the name of the Cohousing Company Limited, a change from David and Helen, who were the initial contracted purchasers. Architect Pat Borer, who designed the low energy houses at CAT (Centre for Alternative Technology) was approached by David to design the scheme a year before purchase. Pat asked to work with Jono Hines from Architype as their offices were much closer to Stroud and they had a great reputation for low energy buildings. Architype became the main project architects. David had design discussions with Jono and Pat during the summer of 1999 and agreed they would design the scheme when the land was eventually bought. David and Helen stipulated that the books Cohousing and a Pattern Language would inform the design. Jono and his team worked with the resident directors as a group as well as individuals designing their internal layouts. Jono attended most group monthly meetings and worked closely with David and the professional team on a daily basis. A couple of early meetings in Woodruffs cafe produced a core group of 5 households who pledged to become members when the land was purchased. Initial payment was £500, later £5,000 was needed to become a full shareholder. The web site, cohouses.net <http://cohouses.net>, and more meetings produced a steady stream of members. Within 3 months David and Helen were paid back their deposit of £150,000, they were still personally liable for the balance up to £550,000 plus interest. The cafe became David’s office where new members were recruited and handed over their £5,000 cheques, (rising to £35,000 after planning permission). The criteria for joining were that members understood and agreed to the principles of cohousing and that they could demonstrate they had sufficient funds to complete the purchase with possibly escalating costs. That was a significant and sometimes scary risk for people joining. This was before planning permission and before builder’s costs. This was a protracted affair. The group decided to use a Partnering Contract. Although this was a new and more egalitarian contract, it was against David’s advice. He wanted a Design and Build fixed price contract, where the builder would take most of the risks. The partnering relationship didn’t work. The group needed a builder urgently as we had lost valuable time. David asked one of the earlier builders, Hodsons, who bid for partnering, to build the scheme. The group reluctantly agreed to use a Project Management contract, where the client took all the risks, that was the deal requested by the builder. After half way through the contract, with ever rising costs, David asked the group to accept a Design and Build contract which would finally give cost certainty. The builder accepted this and we agreed on a concluding all in price. For the first time, this allowed residents to know exactly what their houses would cost. It worked out at £120 per square foot. Although cost estimates had risen continually, the final build cost of a house was about 50% of the market value. The first house was sold for over £410,000 shortly after the residents moved in, their total build cost was about £218,000. The first residents moved in in the summer of 2003, the last ones in 2005. This meant that early movers had the problems of living in and next to a building site. David now admits that he gave a partly contradictory and double message by inviting residents to become directors of the development company. He wanted their support and involvement but not the doubts, disagreements and questioning. For a few that was quite rightly what they thought was their role as a director. However they mostly lacked the experience and expertise that would have been necessary when expressing those concerns. Two major decisions illustrate this. One was when we re-submitted for planning permission, some group members thought it was dishonest to choose materials we didn’t want, just to get an initial permission – after much difficult discussion, that is what we did and we did eventually get permission to use the materials we wanted. Potentially the group process could have jeopardised the project at that stage. The second example was when the group chose not to use a Design and Build contract – this resulted in escalating costs and lack of control over the build quality. David has now built a second Cohousing Community in Stroud called CoFlats at Lansdown. That was developed without early group involvement and with a Design and Build contract. Costs were spot on and quality was high. The downside was that group building for the community of residents took far longer to develop.